My first experience with E-bay was just about 13 years ago. Motor Man and I were planning our wedding, and I was in search of a dress, which I found on E-bay. But that’s a post for another day. I have “searches” stored in my E-bay, which means that I receive emails whenever an item with a particular word (which I’ve entered in the search) is listed. For those of you who may not know, my childhood home is in Surry County, and I now live in adjacent Isle of Wight County. 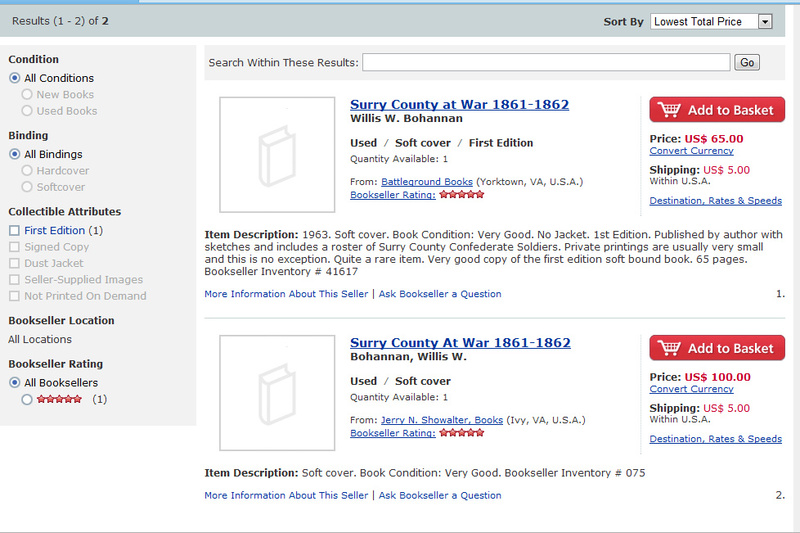 I wasn’t familiar with this “booklet”; it wasn’t among my collection of Surry County genealogical/historical books. The opening bid was $9.00 (with free shipping), so I entered a bid for that amount and promptly forgot about it. A few days later, I received an email saying that I’d won the auction, so I entered my Paypal information. And promptly forgot about it. Monday, Motor Man and I stopped to get our mail, and there was a package for me. I wondered what it was, because… I had forgotten about the book. Motor Man was chuckling as I began flipping through the pages and squealing with delight at the content. 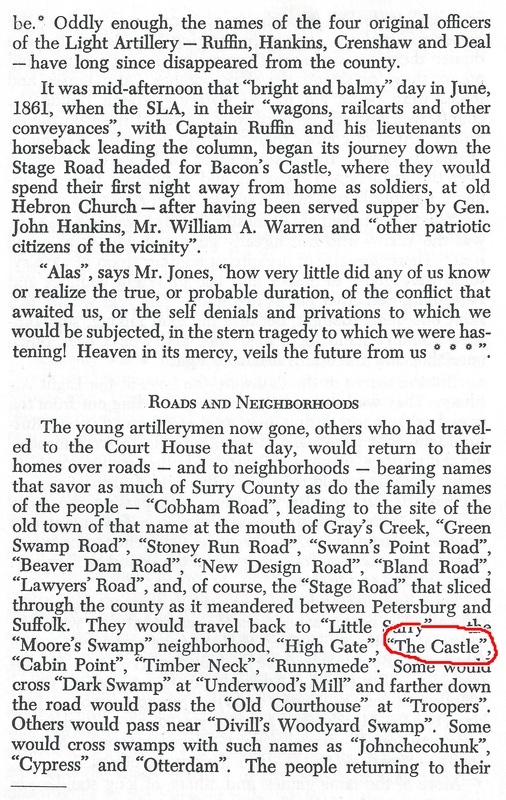 There are several mentions of Bacon’s Castle and many other areas and people of Surry County that are so familiar to me. This page, in particular, notes many neighborhoods within the county. I grew up in the little village of Bacon’s Castle, and those of us from that area have always referred to it as just “The Castle”. And our home was on the Stage Road that’s mentioned on this page. I decided to do a little research about the book, and discovered that the Surry Historical Society has a reprint of it, which sells on the web-site for $19. I dug a little deeper and entered a search for the original, published in 1963, on a couple of out-of-print book web-sites. I found there are a few available. You may need to click to enlarge, but the least expensive one is $65.00. So, once again, thank you, Ebay. 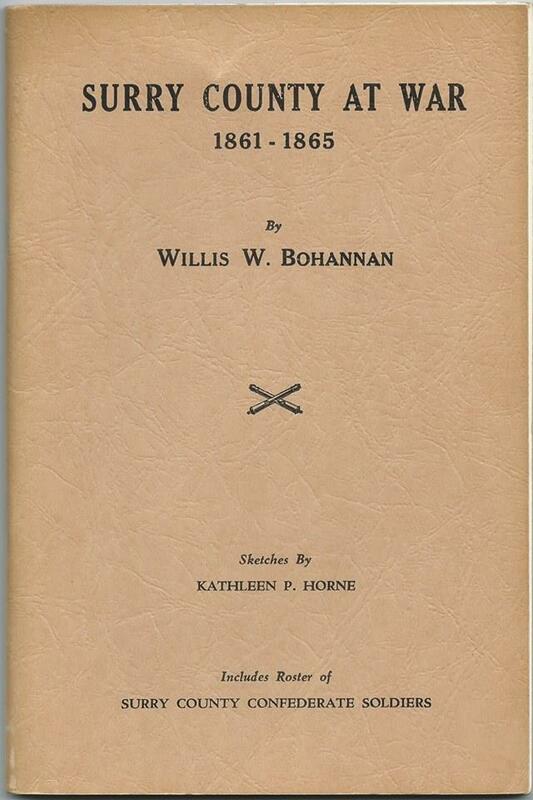 This entry was posted in Days at Home, Family and tagged surry county at war, willis w bohannan. Bookmark the permalink. Congratulations on your find! I’ve never used eBay but know it’s a great spot to look for all sorts of things you can’t find elsewhere. I can’t wait for the post about finding your wedding dress on EBay ! I’ve heard e-bay referred to as our nation’s attic. Funny, I ‘ve heard the Smithsonian referred to in the same terms. Isn’t it fun how we can be thoroughly surprised when we least expect it? Thank you for sharing. Very interesting post and read. That is an amazing find! I love to find things like that on eBay and you know that I have gotten my share of lovely teapots on eBay!!! What fun to get a copy with such great history of places you love. What a nice find, Dianna! You are quite the treasure hunter. I think I bought that booklet from the Historical Society…a lot of the passages sound familiar. Or it might be taken in part from “Under the Stars and Bars. Either way, it’s a great find. EBay is like going on a treasure hunt!! Oh, that is marvelous! I have never used e-bay….sort of leery of it, for no real reason. I need a tutorial, Dianna!! What an interesting find. You are the queen of e-bay! What a great find!!! I love the number of times you “forgot about it” – I do that all the time – glad I am not the only one!!! I have never experienced eBay! I too am a bit leery. Maybe because CH’s Uncle bought a honkin’ big Ford truck on eBay and the deal and some of his money went south.. or was that Craig’s list? But you found a wonderful treasure. I need a four drawer storage thingie with specific measurements maybe I should browse eBay. Looking forward to looking through it ! Books are fabulous, especially when they hold historic meaning for us. How wonderful that you found this one. I need to learn how to navigate EBay! You need to teach me as you have on so many other things that we both enjoy! That book looks to be in mint condition! How exciting to learn new facts about our home town. Great find. What a nice surprise–twice! I need to add some new search terms to my eBay. Seems like a did that a long time ago. Thanks for the reminder.